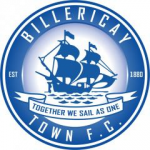 Billericay Town have been drawn at home to Barking in the League Cup, the date has now been confirmed for Tuesday 19 September. Justin Gardner, who was joint manager with Town until the end of last season is now joint manager with Barking. Amongst the squad at the East London club are Abs Seymour, Goldy Capela, Danny Fitzsimons and Kresh Krasniqi who all played for Town last season. Town defender Will Putt joined Barking on loan before the start of the season.